'Bobby' is one of hundreds of thousands of week-old calves discarded yearly as 'waste products' of the dairy industry. Cows are naturally doting mothers. But in the dairy industry, 'motherhood' is anything but 'natural'. Most people aren't aware that in order to produce milk, dairy cows are kept almost continually pregnant. Unwanted male calves (known as 'bobby calves') are sent to slaughter in their first week of life so that their mothers' milk can be harvested for human consumption. Take action now — or keep scrolling to learn more. 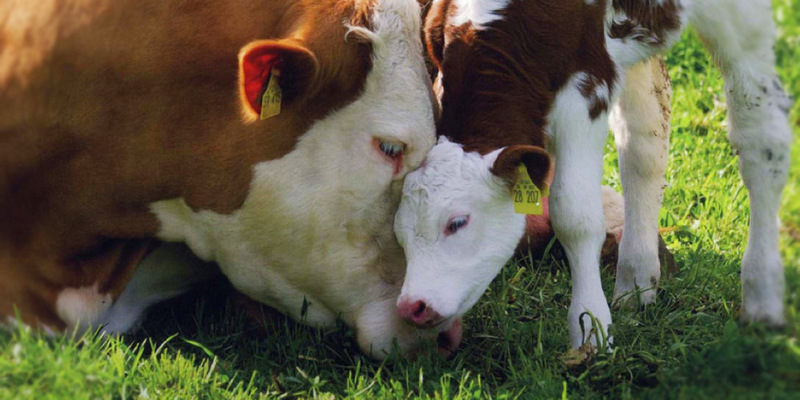 Cows — whether raised for meat or dairy — develop strong bonds with their newborn calves. Like humans, mother cows carry their unborn young for nine months. However, dairy calves are taken away from their mothers within 24 hours of birth, causing severe distress to mother and calf. Grieving mother cows can be heard bellowing (sometimes for days) for their missing young. Even organic? What about sheep or goat milk? Certified organic dairy production rules mean that cows cannot be dosed with antibiotics, must be given organic feed, and raised in a more comfortable environment than conventional farms — but the cruel routine of removing young bobby calves from their mothers is still usual practice. 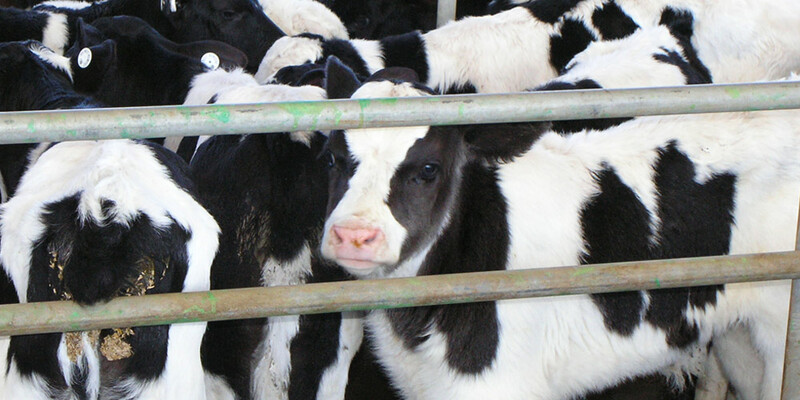 Dairy calves can also still be exposed to painful procedures such as disbudding or dehorning. These operations, or 'animal modifications', are required to be carried out with a 'minimisation of suffering to the animal' — but the reality is that surgery without anaesthetic is not illegal, even in organic farming. Just like cows, goats and sheep must give birth in order to produce milk. Kids (baby goats) and lambs will often be put through the same surgical procedures as calves. Unneeded kids and lambs are also tragically removed from their mothers and killed in order to harvest more milk for human consumption, and the production of cosmetic items like sheep or goat-milk soap. Some male kids and lambs may be kept for several months before being sold for slaughter and human consumption. Most of us know that a good source of calcium in our diet is essential to developing and maintaining strong and healthy bones. But what you may not know is that, through decades-long marketing campaigns, the dairy industry has done its best to convince the world that only by consuming lots of dairy products can we maintain healthy bones. Nutritionally speaking, this is completely untrue. Fortunately, calcium is found in a wide variety of plant-based foods! Some of the best sources include dried figs, sesame seeds, dark leafy greens (like kale), bok choy, white beans, black-eyed peas and other pulses, seaweed (think sushi), fortified soy and nut-milks, unhulled tahini, white/brown bread, enriched fruit juice, broccoli, tofu, soya mince and molasses. In addition to healthy plant-based meals, a weight-bearing exercise routine is essential to strengthening our bones. Exercises that increase bone density, combined with nutrient and vitamin dense whole-plant foods, will give your body the best chance it has to be in peak shape well into your later years. So when you next hear a dairy advertisement tell you that you need calcium for healthy bones — think about what they aren't telling you. It couldn't be easier to strengthen your bones with plant-based and cruelty-free sources of calcium. Going dairy-free doesn't mean you have to miss out on all your favourite foods. The ever-expanding range of calcium-rich and dairy-free products in supermarkets will cater for all your milk, cheese, chocolate and yoghurt needs! Check out the Dairy-free Shopping List for our guide to a whole world of creamy treats that are kind to calves. Send an instant message to the dairy industry asking them to be honest with consumers about the bobby calf trade. Try some delicious dairy-free alternatives that are kind to calves. Order Animals Australia's bobby calf flyer and spread the word in your local community. Help support Animals Australia's work on behalf of calves and their mums by welcoming a plush, symbolic adopted bobby calf into your life.